Advanced data analytics, collaboration tools and AI can help transform your workplace and boost performance at your organisation. Typing ‘the future of work’ into a search engine provides a plethora of options and opinions. Why? Primarily, this sense of both confusion and opportunity is related to the accelerating speed of technological change. Businesses everywhere are asking questions such as do physical offices still matter, what impact Artificial Intelligence will have on humans, and what will this mean for their teams, their clients, and even the concept of a career. Whether discussions are around engaging clients and teammates in a Virtual Reality (VR) world, or humans and robots working in silo, there is a huge mountain to climb before can may bridge concepts of today with tomorrow’s realities. The good news for these visions of a different way of working is that businesses are fast embedding digital into the heart of what they do. Moreover, they are doing so in a way that focuses on the critical aspect of process simplification. Digitisation is allowing teams to employ emerging collaboration technologies with customers and colleagues to innovate based on data and near real time insights vs. gut. However, the core business challenge remains unchanged: how do you determine where to begin with creating this workplace of the future? Moreover, when do you begin investing? Businesses have been speaking about the potentially enormous value of data, yet data analytics is only just now coming into its own. This is mostly due to cloud computing, as well as the advance of the next generation of Enterprise Resource Planning (ERP) embedded services. More businesses are now tapping into the value of their data as many IT platforms – such as Microsoft Azure - now come with advanced data analytics services and AI programmes as part of their core functionality. By recording every detail, from an email to a large purchase order, and feeding them through embedded analytic engines, these tools uncover key insights about the way businesses perform. The benefits can range from something as simple as reducing the licenses of expensive IT tools to those who use them the most to something as complex as shifting resources between regions to meet emerging client demands based upon location shifts identified through mobile traffic. Both scenarios are well proven through existing tool sets and AI, or at least rudimentary forms of it, are now standard in most cloud platform which can help businesses find more and more of these insights - valuable yet perishable opportunities - with little additional investment. When approached properly, this actionable data – often framed as “insights” – can help businesses maintain a clearer perspective over the big picture while making small improvements that add up to major benefits. The traditional model of a physical office is evolving rapidly. Despite being the place where many people spend at least half their waking hours, increasingly the most important thing is what you do at work rather than where you do it. 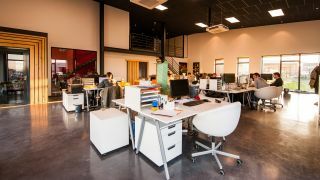 A recent study from IDC revealed that the workplace collaboration market grew 13.6% from 2015 to 2016 and is expected to be worth more than $22bn by 2021, demonstrating the decreasing importance of location. Tools such as Office 365, Slack, and Dropbox are enabling highly-effective real-time and asynchronous collaboration alike. A great example of a successful collaboration environment is Kellogg’s. As a global food manufacturing company they needed to be able to cross regional as well as organisational boundaries. We helped them implement a range of new devices and services, enabling them to create a flexible modern environment that is significantly more productive and secure than what they used before. To give their workforce flexibility without compromising on security, reliability or functionality, organisations will need to continually invest in emerging tools. Cloud computing plays a key role here, enabling IT to move with these novel developments in a way that on-premise solutions simply cannot keep up with. Many depictions of AI see humans being ruled over by soulless computers, with endless masses displaced as the technology takes all of our jobs. However, a positive outcome is far more likely. While no one knows exactly what the future will hold, AI and its associated technologies such as machine learning can give talented people more time to do what truly adds value: being creative, developing strong relationships, and identifying and pursuing strategic goals. As a matter of fact, forms of AI have been in place for decades for tasks require detailed identification learned through repetition, contributing substantially to our improving quality of life. For example, going back to the 1960’s radiological and dermatological diagnostics have leveraged AI to drive significant improvements in early identification of cancers and other issues. AI will therefore continue to focus on automating and optimising repetitive tasks, and more businesses are adopting it for this purpose to drive efficiencies and freeing up resources to invest time in more valuable activities. This will help create two category of new jobs: one which will be focused on using AI technology, and another in roles which we cannot even imagine at the moment. Our latest research found that over a third of business leaders cited AI as the most beneficial tool for customer service, as the quality and consistency of customer interactions improved with the implementation of AI. Many clients named AI as being ‘the best customer service interaction I have had,’ demonstrating how AI can thrive in a closed system where most of the queries it faces are the same. No matter the time of day, the AI gives the same answers and quality of service. This combination of advanced data analytics, collaboration tools, and AI offer a trio of technologies that can help businesses boost performance. Fortunately, many of these technologies can be readily adopted through a variety of cloud computing tools. Those businesses who fail to adopt these in a smart way and challenge themselves are likely to fall behind their peers – especially as the pace of technological change continues to accelerate. So, to answer the question of when best to invest: now.